Do you own the UHD60? Write a review and let everyone know about your experience. I received this unit yesteday and am using it with a Gforce 1080 GTX Ti, via HDMI cable which came with the box. Its short so I had to move my PC for it, but other cables are not allowing pass through of 4K 60 Hz video. The picture, on stock settings, is bright, even with a bit of daylight it is enough to use for videos. Text on the other hand has some ghosting, and not as good as expected, for a 2000 dollar machine. I mainly got this for gaming, so a low lag rate was important to me. Not good. I will test it some more today, and if the problem persists it will be returned. Excellent 4K HD projection. I didn't think a projection TV could produce such a beautiful HD picture on a 10' diagonal screen, but I was pleasantly surprised. Great projector! Resolution is amazing! Currently at 145” from 9’ in my basement. The quality will only get better once I mount my screen. Setting this big guy up was extremely easy for a first time owner of a projector. Image quality excellent, even in areas that are not completely dark. Works very well for video games as well (didn't notice any input lag). This is our first projector and were worried about getting dull images, but this isn't a concern with this projector. Images are so sharp and detailed, they look better than real life. Great projector for the cost. I recently installed this in my basement and it is probably the first thing I'm complimented on! I have it about 14' away from the wall shooting to a 100" screen. The picture quality is amazing and stands up to the Samsung TV behind my bar. I hadn't owned a projector in the past, so I was nervous about the quality, but this thing is awesome and a fraction of the cost of what a 80+" TV would cost. Purchased this projector to replace a 1080P 3D Epson 3010. Had been waiting for this projector to come out with all the hype around 4K projection at a reasonable price . Highly satisfied of the purchase ! For 2500$ you can't go wrong ! Better luminosity , 4K HD is impressive and Colors and accurate and bright ! Go for it !! You will not regret it ! Amazing picture, clearly the best value on the market right now for 4k. Excited to watch all my favorites again with the higher res on my brand new big screen! Beside the darkness, mostly like UHD65, and i really save more money in it . Nice machine nice quality ! Got this after much research on the projector and specs. and it was a good decision to put $2000 into this and worth the wait of a Pre-Order. I am really impressed with the overall quality of the projector, the ease of use and settings, the flexibility for multiple inputs including 2 HDMI input ports. I am using it 13 ft away ceiling mount and gives me a 135" diagonal maximizing the viewing space in my basement. Picture quality is exceptional from the HD programming of my DISH Network and have yet to try out a true 4K source. Projector is pretty heavy so don't compromise on the ceiling mount and I custom modified a standard mount to add a 100% fail safe, so my investment does not come crashing down. I am using Certified HDCP 2.2 compliant HDMI on both ports regardless, one HDMI is connected through my Onkyo TX-SR702 7.1 AVR and the MHL port is directly connected to the output of the DISH Joey to prevent any signal loss from attenuation. Have connected the VGA port just in case I meed to hook up my laptop directly, if not through the AVR. No quality compromises on any wires hooked to the projector, since I have a 25 feet run from ceiling to AV, Satellite and Internet source. My advice that you buy the best wires you can afford for this projector and you won't go wrong on picture quality, after all the projector will display what comes to it. The on-board speakers are quite loud, if you do not wish to use this through an AVR all the time i.e. for normal TV watching on big screen. One thing that I did not like is of the panel door, which is rather flimsy and does not shut well leaving small gap, but again after the projector is set up I would not be opening this panel every time. One neat feature is you can select the color of your projection surface and I have blue walls and the colors are still very vivid and see no difference in the quality. I will also be building my own fixed screen in the upcoming weeks, using Elite ZRM-135HW-CINEWHITE material, to complement the projector quality. Overall this is a great projector and a great investment hopefully for a long time, since this is my first projector ever and it just took me 15 years to be convinced to build my own home theater. This is a very impressive projector. I've been waiting for an affordable UHD projector for years and Optoma finally has delivered it. I was encouraged by the mostly positive reviews in my purchase of it, but after setting it up it surpassed even my inflated expectations. This thing is incredibly crisp, even with 1080p source content. I've owned 4 projectors prior to this and it is better in almost every way (not just resolution). Some of the negative reviews on Amazon are indicative of people who may not understand that to receive 4K content, each piece of the setup (i.e. reciever, HDMI cables, other A/V equipment) also needs to support 4K. The end result is only as good as the worst piece of equipment allows. A cautionary note for prospective buyers: there is no support for keystone adjustment so make sure it's mounted dead center to the viewing area. If you're on the fence on this, don't hesitate. Buy now. I am so impressed with this projector! Amazing resolution and colour quality for such a reasonable price! I used Benq w1070 but everytime I watch the movie with it, I feel like the color is not good for me to do it. I want to get UHD 65 but this is good enough to have an experience 4K. I upgraded to this projector from an Epson that costs four times as much. I actually upgraded to the Optoma and sold my Epson for far more than this projector and I haven't regretted it for a second. This is a true breakthrough in technology at a reasonable price. To get a 4K DLP projector prior to this was a minimum $8,000 proposition and this projector produces a comparable image for a small fraction of the cost! Image is bright and beautiful. Admittedly, blacks could be deeper but when you consider the price, this is a no brainer purchase. Highly recommended. I am BLOWN AWAY! Upon receiving this unit, I instantly noticed haw large the unit was compared to my 1080p projector. That's never been an issue for me before so I got to connecting my mount, hoisted this bad boy up, turned on a 1080p source and BAM, the difference was instantly noticeable. The brightness, the colors, the detail, all pooped out at me.....and my source was the same as I'd always used. Lucky for me I had just received my 4K Roku Premiere Plus to really test it out. I started up House of Cards and WHOA, the clarity was amazing! Everything with the projector is very straight forward and I'm now looking forward to playing Xbox One X (the reason I upgraded to 4K) on this bad boy. Whether you're a gamer or not, this bad boy will make any video source you put through it look better. I recommend this product! Crystal clear resolution, incredible contrast and eye popping color! My 3rd Optoma, started 720p, then 1080p, now 4k and everytime we upgrade my wife doesn't think it will be that much better and even she can't believe how each jump just keeps getting Better! Ill put this projector paired with a good screen against all flat panels. I absolutely love this projector. It's fantastic for UHD movies, the colors really pop and the detail is mind blowing. 4k doesn't really matter in TV's since the screen size is so small. But it has a huge impact when you're viewing a 130 inch + screen! It's awesome for games also. The input lag is super low, and is actually better than my LED TV. It's an absolute blast playing Destiny and Gears of War. This is also fully HDR compatible with both PS4 and XB1, unlike the Epson 5040ub. In closing, this projector is an amazing value for the price it's at. One of the best values in the market. I bought the UHD60 for editing my 4k travel videos and drone videos. It has an amazing picture, almost like a poster on a wall, it is so clear. I installed it in place of my previous 1080p projector that had given a bright and high resolution picture, but this is much better. I went to my 144" screen (about 14' from the projector) to look at the pixels and they were tiny and stable, much smaller than the 1080p projector's pixels; of course, they were not visible at watching distance. I have it mounted on the ceiling and slightly offset L-R from the center of the screen and saw a nice rectangular display, without any tinkering with settings. The zoom has a much better range than my old projector and allowed a display wider or narrower than the screen, should I have wanted it that way. I tested it with a 4kuhd disk in my 4kuhd player, using a new 25' highspeed HDMI cable that was rated for 4k/60 at 18mbps and had no dropouts or other problems with the signal. Besides the good brightness and nice shadow detail, the blacks were so dark I couldn't tell whether the projector was on. And it was quiet, I didn't even notice any noise. So very happy with the UHD60. I didn't look at the dimensions before ordering and going from a HD142X to this unit, I wasn't expecting it to be twice the size. That said I am very happy with the picture. It does seem to be very sensitive to settings however. I had to do some serious tweaking to get rid of over saturation errors on bright reflections in the image on HDR content. Once that was done i found the image very satisfying. Being used to 3000 lumens on the HD142x I could not go backwards to the 2200 that the UHD65 offers. I was concerned that i would not be happy with the UHD60 because it lacks the features of the UHD65. So far I think I made the right choice. Great picture for the price, reasonable contrast ratio. Great colors. Mine unit turn off constantly after less than 2 hours on ECO MODE. Have flicker on white scenes using ECO MODE. So far, so good!. I am happy to own a new Optoma 4K projector to replace my Mitsubishi DLP. The product is very good, very quiet and does not throw off much heat. I like the adjustment for color and contrast depending on the color of the wall. Very happy with the price point for the 4K display. Finally Affordable 4k is HERE! My first projector was an Optoma HD26. A full 1080p projector with great portability and a nice bright image. I then bought and HD37 with and even sharper image and that has satisfied what I've always wanted. A true home theater. But now with the UHD60 having just come out I instantly had to try 4k. For $2,000 it was worth buying. My initial thoughts when it arrived was how big it was. I knew this was a serious projector. The 4k picture from laptop to the projector was so crisp and even more so after I adjusted the picture to my settings. MY ONLY COMPLAINT : NO KEYSTONE! That makes this projector not for the average user. It has to be aligned perfectly. But other than that I use it more than 70 inch 4k TV upstairs. Twice as big and just as crisp. I'd recommend only to the true home theater enthusiast. I've been waiting for the price of 4k projectors to come down, and it started to seem like they never would,but I got excited once I read about the uhd60. After looking at the specs, doing a few comparisons, and reading some reviews, I decided to pull the trigger. It did not disappoint. The image is very bright. Even with quite a bit of ambient light, the wash out isn't as bad as you'd think. If you paired it with an ambient light rejecting screen you'd really be happy. This is in our living room and right overhead of our seating, but you can barely hear the fan. It's so much quieter than our previous projector. The 4k really squeezes out every detail of the image. The real high point is the HDR. I wasn't sure what to expect from it, but man it makes the colors so much more vibrant. The only knock on it for me would be that there is no 3-D option available. My family and I really enjoy them so that is one thing that's going to be missed. I would have given it Five stars if not for the lack of 3-D. The trade off is well worth it though. I was skeptical at first..how is it possible to yield a 4k UHD HDR projector at a fraction of the price of a traditional LCD projector from other well branded names? Well, I was so amazed at how accurate the colors were right outside the box. The setup was quite simple, although positioning can be limited though. The only caveat I have was switching from 4k to non4K content. Apparently, the screen goes blank as the projector registers a change in resolution, which can be annoying at times. After calling tech support, they verified that this was inherent of the product. Aside from that, the 4k projector business in here at reasonable prices with astounding color, clarity, and resolution. You can achieve a stunning 4K image for TV prices. And that image is going to be BIG! Even during the day in a bright room you are going to get a good image. It really does deliver an incredible image. Controlling this projector is super simple. They may have taken their own sweet time getting here, but 4K projectors using DLP technology are finally starting to arrive. The first of these affordable UHD beasts is the Optoma UHD60, a 4K HDR projector that has all the benefits of a standard DLP projector, plus a few of the perks of a 4K flatscreen. The UHD60 is a prime contender for AV bargain of the year, delivering genuine 4K and HDR thrills at a price that instantly leaves many of its rivals with some serious explaining to do. Best 4K Projector for Bright Rooms: This 4K projector has a lot going for it. It’s one of the quietest 4K projectors under $2,000 and its high brightness means that it can perform better in rooms with more ambient light. The UHD60 can convert SDR content to HDR and it does a pretty good job. There are no jittery movements in the image while it is processing non-HDR content. Image sharpness is fantastic, you don’t seem to lose any fine detail, even in complex scenes. The UHD60 is a projector that delivers on multiple fronts. Great image quality. Great colour and contrast. The HDR implementation is not overdone – it looks very natural. And the lack of fan noise is absolutely wonderful. It’s even got that lens shift dial to ease the pain of set up. UHD60 is a state of the art 4K Ultra High Definition (UHD) Projector for home cinema and home theater capable of delivering ultra sharp images with a high level of detail and breathtaking color. With 4 times the pixels of 1080p, an Ultra High Resolution of 3840×2160, 3000 lumens, 1,000,000:1 contrast ratio, High Dynamic Range in the form of HDR10, vertical lens shift and a massive 1. For a projector to provide a quality image outside, 2000 lumens is the lowest you can go in terms of brightness. Outdoor projectors should also playback in at least HD resolution to ensure the picture is of reasonable quality. The Optoma UHD60 earns our top spot thanks to its incredible 3000 lumens output, super high quality 4K resolution and massive contrast ratio. If you want the best, you’re going to have to be prepared to pay the price – RRP £2499.99 to be precise. However, for your money, you receive stunning 4K quality, incredible colour contrasting and stereo sound. In Dunkirk, you’d immediately see the detail and sharpness of the image that I didn’t even notice with my 4K TV. Moving on to Mad Max: Fury Road, I was amazed by how HDR effectively offered a deeper colour gamut on the scenes. Overall the Optoma UHD60 delivered what it was meant to do: a great 4K HDR experience you’d normally find on high-end 4K TVs. Once up and running, gaming on the UHD60 is absolutely stunning. The projection is vibrant, and exceptionally detailed - it’s easy to forget the image isn’t running straight off a mammoth panel until you turn the beamer off unveiling your bland off-yellow wall. What really makes the Optoma UHD60 special is the price. You might blow air out of your nose at the sight of the price tag being lauded as ‘affordable’ but for a 4K, HDR-capable projector, it’s a steal. Optoma have put together a menagerie of features - previously kept locked behind gargantuan price tags - into their UHD60 projector. 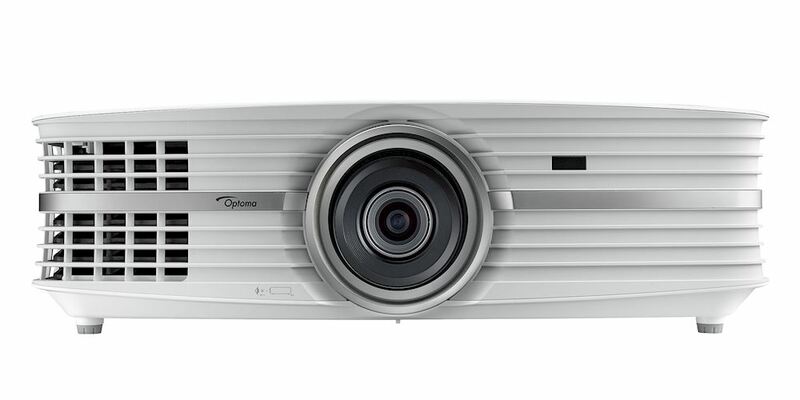 FLYING THE FLAG for affordable 4K projection is this sweetly-styled DLP model from Optoma. Its large screen images are blisteringly sharp – this resolution revolution backed by a 3,000 Lumens brightness punch and shadow-detailing talents that work well with HDR sources. Colour handling impresses, too, as does the level of calibration/ setup ﬂexibility on offer, including a 1.6x zoom and extensive throw ratio that makes the UHD60 a simple ﬁt for your cinema room. When watching something in 4K it is simply stunning. Almost like a window to the world outside. Hooking up my PC to the projector I watched some of the 4K nature videos on YouTube and you feel like you could step into the scenes. It is impossible to describe in the written word the step up 4K gives you when compared to the current HD images. You just need to try and experience it for yourself. Once you get it set up to your liking you will find the images are rich, balanced, sharp and dynamic. The projector can deal with fast-moving images without thing becoming blurry. Playing video games was a delight with the processor having no problem keeping up with the fast gameplay ensuring a high-quality gaming experience. The Optoma UHD60 makes 4k projection affordable. It offers a very sharp appealing picture, which can be used in Cinema and Vivid modes. The projector is very good suitable for photo clubs and AV users, if they are limited to smaller forums. "The Optoma UHD60 brings you 4K and HDR for under $2,000, it's remarkable...I keep trying to find something I don't like about this projector, but so far I haven't found anyting. As far as I'm concerned, this is one of the top 3 consumer-level projectors on the market this year, and it might just be my favourite." "This product is a pleasure! The detailed resolution is unique in this price segment with its high brightness output, the projector is currently the most affordable UHD projector for home cinema". "The Optoma UHD60 projector is one of the most exciting new products in the audio/visual world of 2017." Until I received the Optoma UHD60, I was sure that no remotely affordable projector could ever do both 4K and HDR convincingly. I’ve never been happier to be proved wrong. Its native 4K claims, meanwhile, are backed up by outstanding image detailing and sharpness when watching 4K sources. There’s no way any HD or even pseudo 4K projector I’ve seen to date could match the intense textures, fine shading, and freedom from both jagged contours and visible image/pixel structure that the UHD60 enjoys. Right from the off the UHD60’s images stand out from the same priced competition thanks to an impressive blend of sharpness, detail and HDR-ready brightness. The biggest and best surprise about Optoma’s UHD60 is how well it handles HDR. The UHD60’s bright , ultra sharp and impressively balanced pictures make this affordable PJ an instant hit. Looking for an upgrade on a Full HD model? Look here. “The UHD60 is a prime contender for AV bargain of the year, delivering genuine 4K and HDR thrills at a price that instantly leaves many of its rivals with some serious explaining to do." “Performance - This, if we're honest, is where we’d expect the UHD60’s wheels to come off. But they don’t. Not even a little bit." “Here’s the bottom line: If you’ve been waiting for 4K in a projector, this is the one to get."